This Summer besides me not having a working laptop until last week, my skin has been so up and down, it’s insane. For about 3 weeks I was suffering with such dry skin – me! Dry skin, in Summer. That was very unlike my skin, also it was dry and scaling. Being someone who is used to combination skin that of normal and oily that can go dry in Winter but not majorly, it was a skin nightmare for me. As I haven’t had a laptop, I didn’t want to really use products that I needed to review but when I saw that one of these in the bunch was a hydrating lotion, I had to reach for it to see if it’ll benefit me! So, what’s the range? It’s called Botanics. Botanics have the know-how of world’s leading plant experts at Royal Botanics Gardens, Kew, that gives us, simple ingredient led, natural skincare that works. Botanics Organic: for healthy – eating forever skin. Powered by Rosehip, the plant that feeds your skin and helps nourish and restore glow. 100% Organic with Rosehip Nourishing Facial Oil (all skin types) £11.49. This has sweet almond oil, argan oil, bergamot and lemon peel oil. With such amazing oils, there’s no doubt that this oil is nourishing and works amazingly to seal in moisture with or without lotion underneath. Smells pleasant and sinks into my skin without clogging and gives me a nice glow. Botanics All Bright: for two-hours-of-lotus-position skin. Powered by Hibiscus, the plant that makes your glow. Illuminating Radiance Balm (all skin types) £5.49. This balm promotes a radiant and even skin tone, to leave the skin with a glow veil. There are small particles that when the light catches the skin, gives a radiance which I love, the face is prepped for a nice base makeup wise or without. It’s smooth and non-greasy – I’d purchase this one without a doubt. Botaincs Hydration Burst: for weekend-of-mindfulness skin. Powered by Clary Sage the plant that help hydrate your skin. Hydrating Day Lotion SPF 15 (for dehydrated and sensitive skin) £8.99. Aims to comfort and sooth dehydrated and sensitive skin. Its lightweight texture absorbs easily and I can attest to that, as it worked well on the dry patches on my face, it keeps the skin hydrated for 8 hours. The first time I used this, the next morning I was surprised at how the dryness subsided. Botanics Radiant Youth: for spirulina-smoothie skin. Powered by Ginkgo, the plant that helps defend youth. Refining Microdermabrasion Polish (for younger looking skin) £9.99. This was gentle for me to use to slough off those dry patches. It’s a very gritty texture with very micro small particles, I found it gentle to just use every other day although it’s suggested for once a week. Another purchase! Botanics Triple Age Renewal: for you’re-as-young-as-you-feel skin. Powered by Purple Orchid, the plant that plumps and smoothes. Firming Night Cream £10.49 - Hydrating Eye Serum £11.99 (for maturing skin). The night cream has a tri-blend of hydrating hyaluronic acid, firming vitamins and soya protein alongside purple orchid extract to reduce deep lines and wrinkles. The eye serum targets the exact same things, to be used morning and evening along the bone below the eyes. It has a very watery consistency, first time I used it it just ran off the finger tip so it’s best to put on the back of the hand and dip with the ring finger and apply but I was amazed at how well and quickly it absorbs. It seems with this range there's no waiting time, which is good for those who don't have time to wait around for their skincare to settle in before they apply their make-up. This range is available at Boots, formulated without parabens, cruelty free and last but not least, super affordable. I highly recommend checking out the Botanics range, if you've not already. Plus it solved my dry skin - just there it deserves the noble peace prize because girrrrrl, war was about to break the F out! 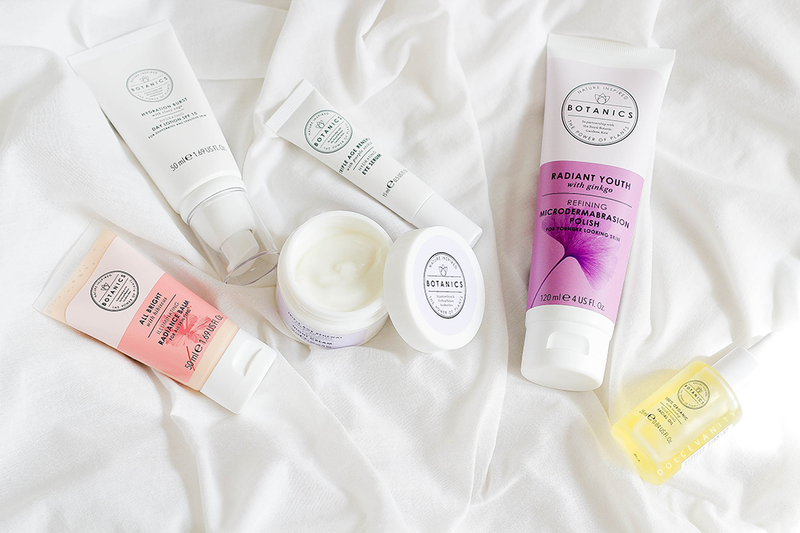 Have you tried Botanics yet? What is "Healthy eating forever skin"? Haha, that's ok. Skincare that gives the benefits of that you've been eating healthy. Ooh love the packaging, looks so much better! I've tried a few bits from this range and it was good! I love the packaging! And the fact that the products have natural plant based ingredients. I've heard how good rosehip is for the skin! Haven't tried this brand before, but they sound promising. I'll have a look a their range. Need to get some moisturiser for myself as winter is fast approaching. How have I never heard of this brand! It sounds amazing; will have to check them out and especially the botanics all bright; love the sound of that!